American Oversight has filed a lawsuit to uncover the facts surrounding the Trump administration’s move to ban transgender individuals from serving in the U.S. military, which the president announced via Twitter. Any analysis or recommendations provided by senior military or DOD officials to the White House regarding the implementation of a ban on transgender individuals serving in the military. Records of communications with various upper-level military personnel from a variety of military offices regarding Trump’s announcement of a transgender ban via Twitter. 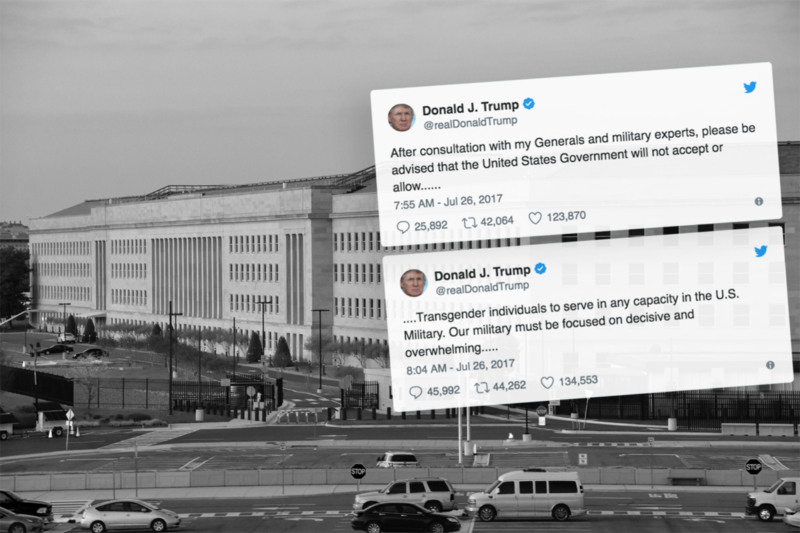 On July 26th, 2017, President Trump announced through a series of Tweets that transgender individuals will no longer be allowed to serve in the U.S. military. In announcing the ban, President Trump claimed he was advised by “my generals,” but news reports indicated that the Pentagon was caught off guard by the tweets and was unprepared for the policy change — suggesting that the move was not in fact recommended by military leaders. The full set of emails we obtained from the hours following Trump’s tweets are available online here. American Oversight is continuing to investigate what the DOD knew before this policy change was revealed to the public. We submitted a FOIA request seeking all documents and communications related to this decision, including any analyses or recommendations from any military personnel provided to the White House that could have influenced DOD’s policy regarding the service of transgender individuals in the U.S. military. Despite surrounding legal battles, federal courts and the Pentagon have subsequently stated that transgender individuals will be able to continue enlisting and serving in the military and can sign up starting January 1, but the White House and Justice Department are fighting to enforce the president’s original ban. American Oversight submitted subsequent FOIA requests seeking additional records from DOD to determine if the White House and military personnel were aware of this policy decision before Trump’s tweets. American Oversight sued the Department of Defense (DOD) in federal court to determine if President Trump was telling the truth when he claimed on Twitter that "generals" had advised him to ban transgender individuals from serving in the armed forces.